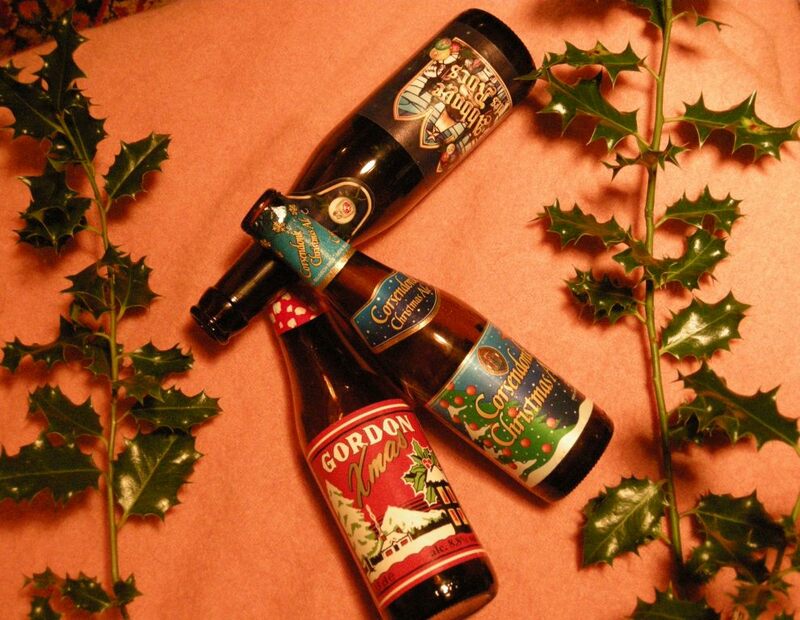 Christmas Ales – what’s that all about then? I’ve got to be honest I have a prejudice against so-called Christmas ales. I think it comes from being given festive gift bottles by well-meaning relatives the twee labels of which were enough to actually put me off drinking the contents. The other issue I have about Christmas ales is the ones that haven’t been brewed for the winter festival but merely badged or labelled as such to encourage people to drink them at this time of year, which is at best lazy and at worst cynical (although there are a few exceptions to this rule). Still, if you were reading this blog at about this time last year you may recall my failure not only to find a Christmas ale worthy of the name, but even to try any, and I felt that I had to try and rectify the situation. 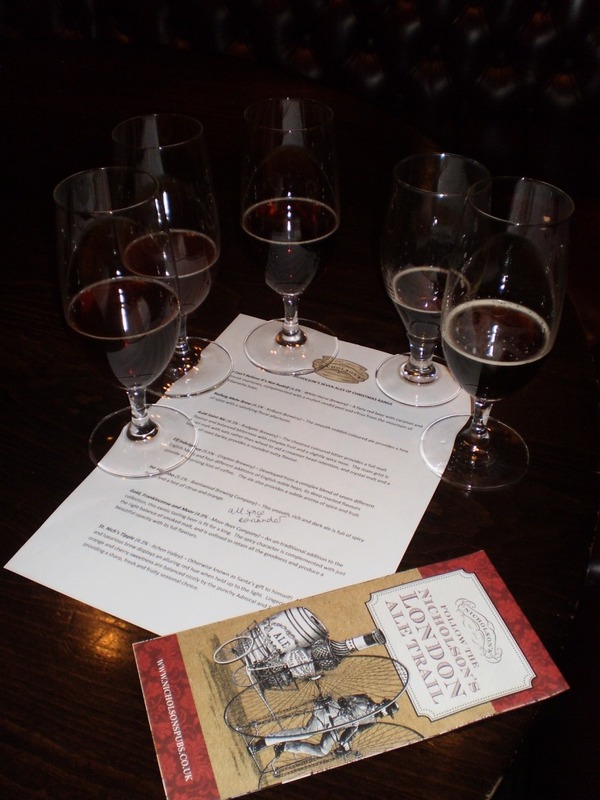 With this in mind I determinedly took up an invitation from Nicholson’s Pubs to their Christmas Ale tasting. The pub chain – which served more than 4.5 million pints of cask ale between September 2010 and September 2011 – has collaborated with its key brewers to develop an exclusive range of seven Christmas ales. So it seems we can safely say these have genuinely been brewed with the festive season in mind. I Can’t Believe It’s Not Rudolf (4.8% – White Horse Brewery). A very dry astringent beer with red/dark berry notes. Nollaig Mohr Brew (4.5% – Kelburn Brewery). Another astringent beer, this one put me in mind of cinnamon and had a dry tangy finish. It also had a powdery charcoal aroma that reminded me of Guy Fawkes night. Auld Saint Nic (4.3% – Rudgate Brewery). I found this one a little too thin/light in body for my liking. It had a treacly aroma. Elf Indulgence (5.5% – Cropton Brewery). This blend of beers possessed a softer quality than the first three and didn’t share their astringency and dryness of finish. Ho Ho Soho (5.1% – Brentwood Brewing Company). A roasted coffee bean aroma hinted at the rich, roasted malt flavour this beer had. It also had a decent bitterness to it and a dry aftertaste. Gold, Frankincense and Moor (4.8% – Moor Beer Company). Lapsang souchong style ‘burnt’ flavours leading to a citrussy finish with elements of sweetness too. St. Nich’s Tipple (4.3% – Itchen Valley). There was a floral, peach and apricot flavour to this pleasantly bitter beer and also a malty, cerealiness. Although I think Nicholson’s Pubs and the seven breweries ought to be commended for this festive range of ales none of them said ‘Christmas’ (or rather Winter Solstice) to me. They were good beers and I especially enjoyed the bitterness of them, but none of them made me feel like decorating the Christmas tree, putting on my copy of The Best Christmas Album in the World Ever, or breaking out the mince pies. They didn’t make me want to go down the lane near where I live to pinch holly from the hedgerow, they didn’t make me think “Ooh, this’d be nice after a stressful Christmas shopping trip,” and they didn’t invoke a desire to eat turkey. So despite the best efforts of a number of brewers I was still unconvinced by the concept of Christmas ale. I thought back to a December night in Paris a few years ago and the Affligem Noel – did I dream its Christmasiness? (I made no notes about it), does it still exist? (I haven’t been able to track any down for purchase online) – and wondered if I should order a few Belgian Christmas beers and see if they made me feel any different. They didn’t. Despite the wonderfully speedy and friendly service from Beer Ritz (www.beerritz.co.uk) the beers I selected still didn’t bring out my Christmas spirit. I tried Corsendonk Christmas Ale which was a delicious tangy, astringent brown ale with spicy, orange peel, plum and dried fruit notes that now I’m writing about it sounds like it was Christmassy but didn’t taste it. I gave Gordon Xmas a go – another Belgian brown ale with a pleasing burnt sugar/caramel flavour leading to a dry chocolatey aftertaste – but still I couldn’t hear sleigh bells. Finally I cracked open a bottle of Abbaye des Rocs Special Noel, which to my palate was a foul and phenolic (meaning it had a medicinal, or to be specific, disinfectant like flavour) brew but perhaps it’s meant to be like that and I don’t care for the style – and as you may have gathered it didn’t remind me of Christmas. Unless it was that year I had a really sore throat and had to gargle with TCP. I started to feel a bit Scrooge-like. Maybe I just can’t open my heart to the idea of Christmas ale. But then I had a thought. I have had a beer that made me feel festive and I’ve had it this year. The day before Nicholson’s Christmas Ale tasting, I went to The Bull in Highgate for a Schneider Weisse beer and Jumi cheese tasting (and I have to say that these were most delicious cheeses, especially the Belper Knolle – a dried cream cheese with Himalayan salt and garlic coated in black pepper which I suspect would be amazing grated over pasta and served with cherry tomatoes and rocket! You can buy it at Borough Market in London if you want to try it out) and had the pleasure of trying Schneider Weisse’s Aventinus Eisbock. This whacking great 12% beer has an aroma of alcoholic bananas – in fact it has big fruity banana nose but it gives way to sherry-soaked fruitcake with hints of chocolate and now I’m getting that Christmas – or Yule as I prefer to think of it – feeling. Aventinus Eisbock has a warming roasted taste, infused with fruity alcohol-laden christmas cake flavours, cloves and hints of cinnamon leading to a chocolatey aftertaste with suggestion of black cherry and it’s all wrapped up in a deep, smooth velvety mouthfeel. Now I’d found my Christmas ale I was very glad to find that Beerritz had it in stock! (Although you’d best check they still do before you get too excited). The beer is basically Schneider’s dark, rummy Aventinus blended with Aventinus Eisbock and then aged in Pinot Noir casks. Up until the 1940s, Aventinus was shipped to (or should that be from?) Bavaria in containers without temperature control, and thus the beverage partially froze during transportation. People were amazed by this version of Aventinus – that is stronger in flavour and alcohol because of the distillation – and by chance the first Aventinus Eisbock was created. Well aware of this story, Brew Master Hans-Peter Drexler, decided to recreate the ‘mistake’ in a controlled environment. Sixty years later, the Aventinus Eisbock was reborn. What could be better, a reborn drink to celebrate the rebirth of the sun and the lengthening days – now that’s a festive ale. I am a fellow Sophie and came across your blog, particularly as I am the head brewer at Brentwood Brewing Company. I enjoyed reading your comments about the beers and hope your quest will continue next Christmas (maybe try and find our Berry Christmas, it went very well with mince pies and cheese). Being a female reviewer, have you heard of Project Venus? If not look us up on facebook. I think Ember Inns have our Venus Black on at the moment (brewed at Tripple FFF). Worth hunting out.